As the autumnal oranges and reds give way to the bare trees of winter, the prospect of a joyous Christmas spent with family becomes the warm embrace that a cold winter allows us to appreciate that much more. Christmas for me means wrapping up warm and heading to the coast for an invigorating walk or a wintry surf before the promise of an afternoon filled with food, family and fireside games. And whatever it means to you, we hope that these pages may inspire your own magic moments, winter walks and foodie feasts, providing just a small taste of what’s on offer if you’re lucky enough to be enjoying a Cornish Christmas by the sea. 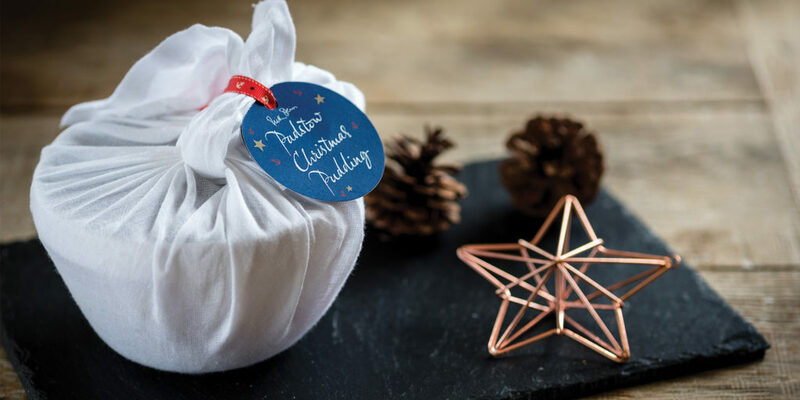 So go on – put your feet up, sip on a warm mug of mulled wine and get the inspiration you need to make this your best Cornish noel yet. 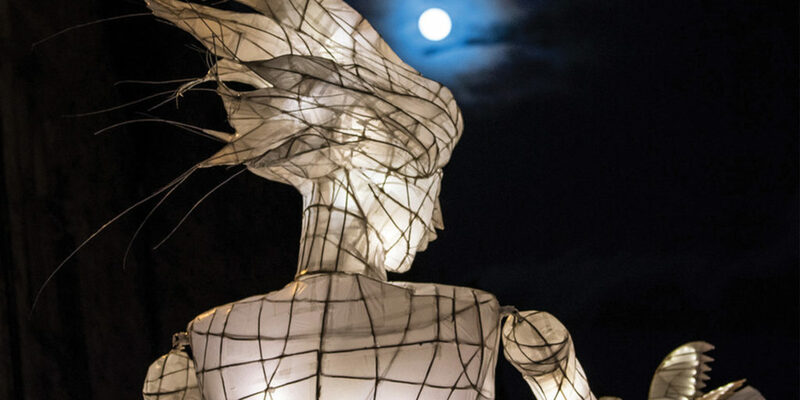 Many of our county’s most prestigious light displays have already confirmed the start of the festive season with giant lanterns handcrafted with willow and tissue paper illuminating the streets of Truro and St Ives in the much awaited lantern parades, but if you missed those, head to Penzance for the Humphry Davy Lantern Parade taking place on 15th December (as seen on page 14). 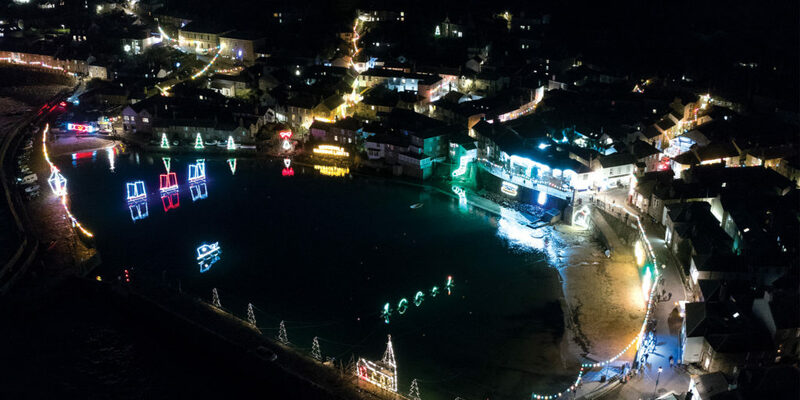 Here at Cornwall Living, we’re eagerly looking forward to the Mousehole Harbour Christmas lights switch on, also taking place on 15th December and promising to be an evening filled with the magical sound of carol singing, the glow of lights glinting off the water and maybe even a warm mug of mulled wine too. 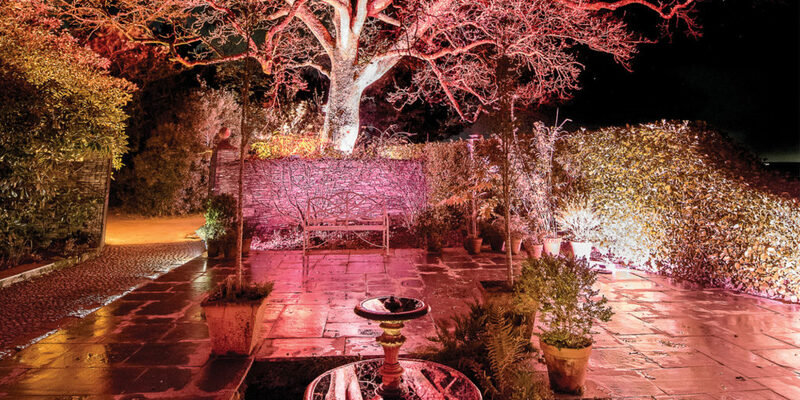 Or, if you want to experience a light display with a difference then head to The Lost Gardens of Heligan and witness the art of illumination during ‘Heligan by Night,’ as internationally renowned light artist Ulf Pedersen returns to reveal the historic plantings under the cover of night. Experience the magic of a country house Christmas at Trevince estate from 7th until 9th December when, in addition to the three usual showrooms, Trevince’s billiard room will be transformed into a Pandora’s box of delights for you to peruse, the hall will sparkle with thousands of Christmas tree baubles and the drawing room and library will omit a gentle glow from their welcoming log fires. Alternatively head to the north coast for Padstow Christmas Festival, which celebrates the talents of local culinary trio Nathan Outlaw, Paul Ainsworth and Rick Stein, as well as a ‘who’s who’ of other award-winning chefs. 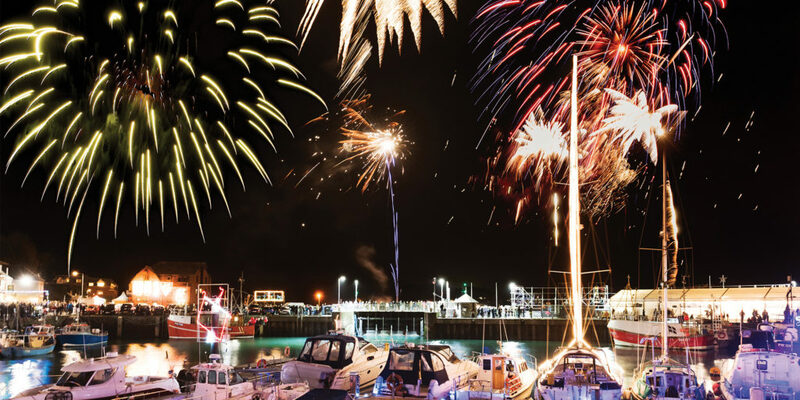 The festival, which runs from 6th to 9th December is one of the largest of its kind in the country, playing host to more than 100 stalls and featuring live music, a lantern parade, Santa’s grotto and a spectacular fireworks display above the harbour. For most of us, Christmas offers respite from a busy working week and provides the chance for a little bit of relaxation, but for one person it heralds the start of the busiest time of year. 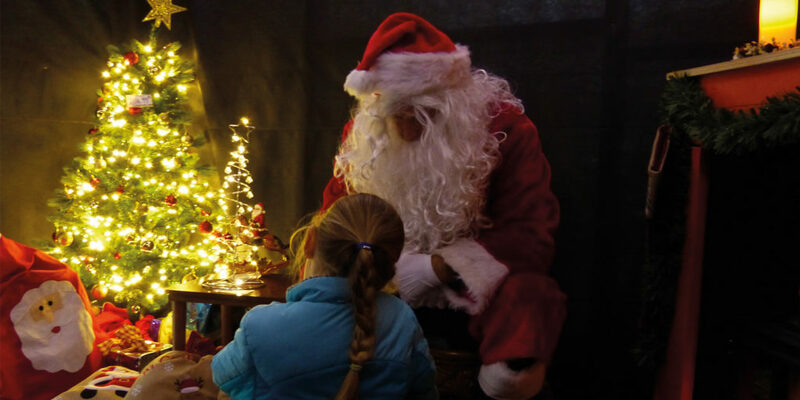 And this December Santa is in high demand with visits to Trebah Gardens, The Lost Gardens of Heligan, Trevena Cross and even Bodmin and Wenford Railway, providing the chance for your little ones to get in their last Christmas wishes before the big day arrives. 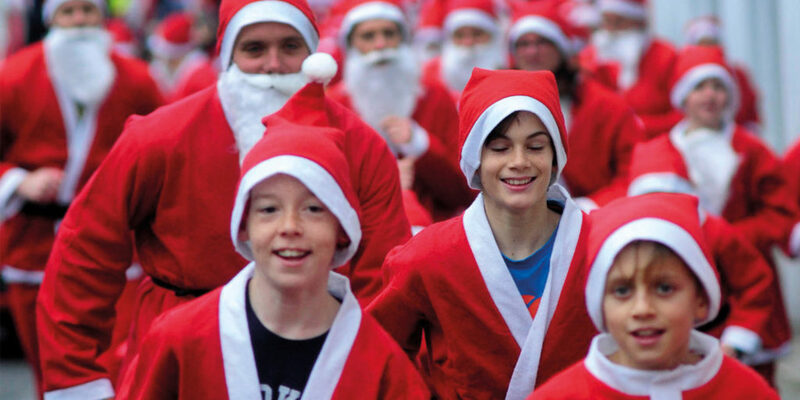 Then there are the Cornwall Hospice Care Santa Fun Runs in Padstow, Truro, Falmouth and Helston, where you can dress up as Santa yourself and warm up with a run around to help raise money for those affected by terminal illness in Cornwall (for more on Cornwall Hospice Care turn to page 16). If you need some decoration inspiration then make sure to check out the Trevena Cross Extravaganza taking place during the first three weekends of December. 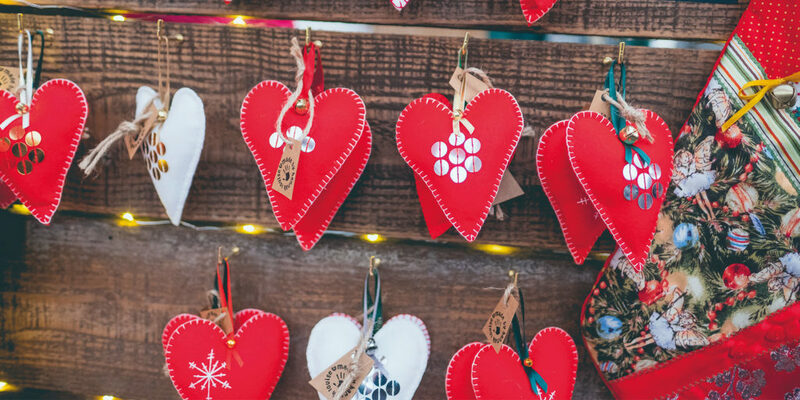 This charity event includes a market with great decoration ideas as well as an amazing selection of real Christmas trees, and although the convenience of a boxed tree makes it the easy option, there’s something magical about picking out your favourite tree with the kids and waking up to the sweet scent of pine over the festive season. The recent Fowey Christmas Market provided another opportunity to peruse some beautiful stalls and is certainly one to put in the diary for next year, featuring inspiring interior design specialist Julian Foye with various statement pieces perfect for winter. There’s something utterly captivating about going to the theatre in December, the sense of audience camaraderie is heightened with festive cheer and watching a live performance just holds that extra special something that a film can’t even begin to compete with, no matter how spectacular the CGI may be. 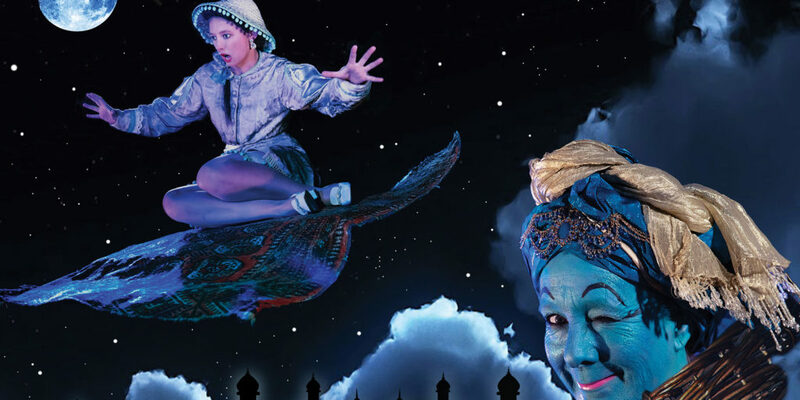 This year we highly recommend going to see Miracle Theatre’s production of Alladin at the Princess Pavilions in Falmouth. Promising to be a mesmerising spin on an old classic, it runs from 7th December until 5th January. Or, be enthralled by Cousin Jack’s magical puppet and live action production of Antonia Barber’s classic children’s story, The Mousehole Cat, performed in the heart of the village in the Solomon Browne Memorial Hall, and allowing you to couple the evening with the chance to see Mousehole’s famous light display as well. If you’re up for something a little more adventurous, head to Tehidy Woods and follow the path deep into a land of myth, legend and festive magic as Old Man Winter’s world of stories, faeries and winter wonders comes to life. 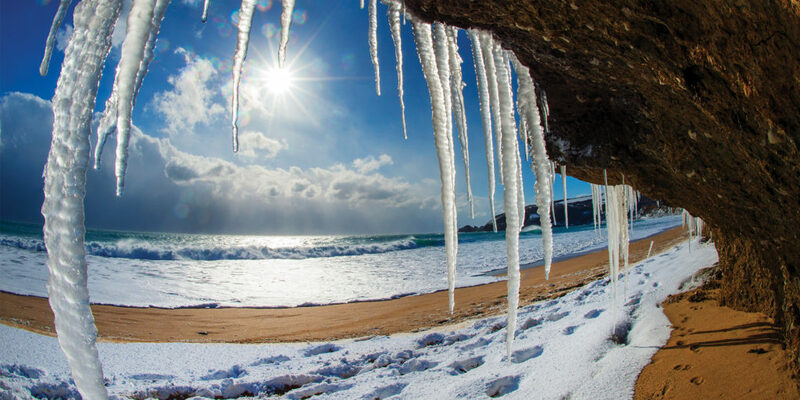 We’re absolutely spoilt for choice when it comes to winter walks in Cornwall and there’s nothing better than hitting the coast to watch the steady rise and fall of the ocean. One of my personal favourites is to walk around Godrevy head. Watching the waves crash and swirl around Godrevy Lighthouse and spotting seals seeking refuge from the surf at the foot of the cliffs is always a magical experience. Or on Boxing Day, why not join in on one of the Boxing Day swims to burn off those excess calories? With organised swims taking place at Trevaunance Cove, Coverack, Sennen, Poldhu and Gylly beach as well as many other popular swimming spots, it’s always great fun for spectators and participants alike and gives you the excuse to go to the closest pub afterwards and warm up with a mulled cider in front of the fire. Many of the swims also raise money for charity, allowing you to spread the Christmas cheer and providing motivation to those brave enough to don their costumes and hit the surf. The gift of giving is wonderfully abundant over Christmas, and to make your shopping even easier, we recommend visiting an Ann’s Cottage store where you’ll find beautiful clothing, water-sports equipment and jewellery (as seen in our recent Cornwall Living Gift Guide). If you’re after something a little more luxurious, Cornwall Gold has an incredibly extensive collection of beautiful jewellery (as seen on page 88). Or, if you’re a silver lover then head to one of the Silver Origins stores located in Marazion and St Ives, where you’ll find an equally impressive array of silver jewellery, inspired by everything from autumn leaves to Cornish waves. For many of us, getting into the festive spirit goes hand in hand with cracking open a bottle of our favourite tipple whether that be a refreshing Buck’s Fizz breakfast, or a smooth bottle of red with Christmas dinner. 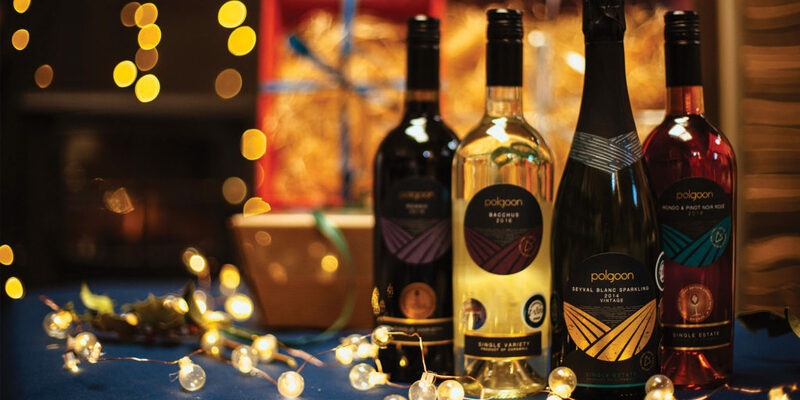 If you want to find the perfect tipple to accompany your meal, Polgoon Vineyard has an amazing selection of some of the finest Cornish wines made from grapes grown right here in the Duchy. Speaking of getting into the spirit, Rick Stein has recently released a limited edition gin in collaboration with Tarquin’s, curated by Charlie Stein and handcrafted using wild chamomile and fennel seeds, which can be collected around the Cornish coast. Similarly, Curio Gin also forages its ingredients from around our stunning coastline. The fragrant botanicals are then distilled in small batches for exceptional quality and a delicately smooth gin, both excellent options for that post meal gin and tonic. My favourite thing about Christmas? You guessed it, food. Ever since I can remember my Mum has created the most spectacular spread of food, commencing months in advance and finishing with our family gathered around the table to enjoy a full-blown feast. 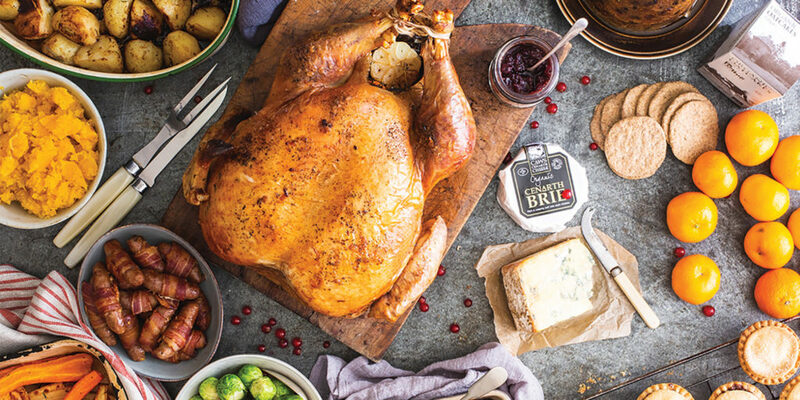 To make the chore of Christmas cooking easier this year we recommend ordering a Riverford Organics Christmas box packed full of organic veggies, meat and cheese. However, if you’re after a wider selection of meat then make sure to visit the Etherignton Meats Farmshop in Scorrier, which sells locally reared beef, pork and turkey as well as their festive feast meat boxes, which can be ordered online. Then for my Dad’s favourite course head to Cheese on Coast in St Ives where an incredibly extensive selection of artisan cheese awaits. 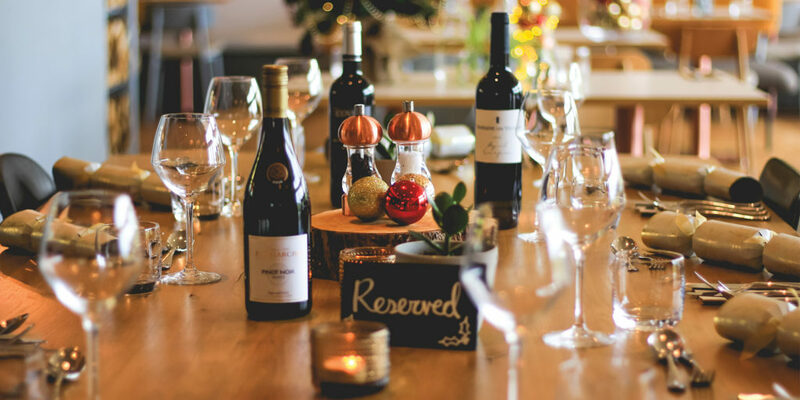 Or take the stress out of Christmas cooking entirely and book a table at Una Kitchen where you can join in on the festive Party Nights – just £29 per person – which include a four-course dinner, music and a wonderful atmosphere to boot. On 14th December they’re also hosting a Swinging Christmas Ball with the Carlton Swing Band to get you up on your feet and on 19th December there will be Carols by the Fire with St Ives Community Choir in aid of the Salvation Army. It doesn’t get more festive than that! There really is a plethora of magic moments to enjoy, whether it’s a family walk along a secluded section of our stunning coastline, a festive feast that leaves you feeling utterly satisfied, or finding the perfect gifts for your loved ones. Hopefully you’ve found some ideas to help make this year’s Christmas in Cornwall the best yet. For now, I suppose all that’s left to say is we wish you a merry Christmas and a happy New Year!